Rather than come accompanied with the usual lengthy and tediously dull press release, news of the latest little lappy to join the Eee dynasty – the 1000HE – crept up on the official Asus Eee PC Facebook group, where it’s available for pre-order. So what’s so special about this one, you ask? Well I’m glad you did my netbook loving chums. Apart from the usual guff that comes hand in hand with the generic netbook (10-inch screen, 160GB HDD, 1.6GHz Atom processor, Bluetooth, WiF), the 1000HE has a new chicklet keyboard (think 90s calculator with the rubber keys but obviously not as old skool), provides you with an additional 10GB of Eee online storage and comes packed with Asus’ own Super Hybrid Engine conversion technology. 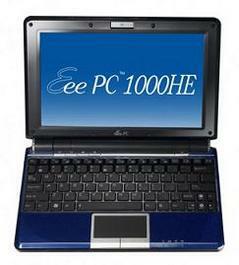 Roll it all into one and you’re left with an Eee PC that is not only the most powerful Eee netbook in town, but the longest lasting one at that. Members of the FB group receive a $25 USD discount off the $399 USD pre-order price, so if you’re thinking this could be the computer for you, I’d get on over to Facebook and enlist too.